Last edited by Batgirl III on Mon Aug 06, 2018 2:17 am, edited 111 times in total. The Emperor of Man wrote: They shall be my finest warriors, these men who give themselves to me. Like clay, I shall mould them, and in the furnace of war forge them. They will be of iron will and steely muscle. In great armour shall I clad them and with the mightiest guns will they be armed. They will be untouched by plague or disease, no sickness will blight them. They will have tactics, strategies, and machines such that no foe can best them in battle. They are my bulwark against the Terror. They are the Defenders of Humanity. They are my Space Marines, and they shall know no fear. ► All Devastator Marines replace one rank of their Equipment Advantage with the Improved Aim Advantage. In the grim darkness of the 41st Millennium, Mankind is assailed on all sides by civil strife, alien invasion, and the foul servants of dread gods. Only one force can stand against this unending threat - the superhuman Space Marines. Forged through forgotten science and strengthened by the rigors of duty and training, the destiny of the Space Marines is an eternity of battle, bringing the Emperor's justice to every corner of the galaxy and ensuring the survival of Mankind. Formally known as the Adeptus Astartes, but known also as the Angels of Death, they are the most powerful of all human warriors. In many respects they are not really human at all, but superhuman beings forged by genetic modification, arduous training, and the rigors of strict discipline. Space Marines are the embodiment of the Emperor's will -- their roaring boltguns bring death to the enemies of Mankind, their presence in battle the difference between life and death. Space Marines are organized into a thousand independent armies, called Chapters, spread throughout the galaxy. Each Chapter is further organized into ten or so Companies, each an a powerful fighting force on its own. Each Chapter has its own ships, its own heraldry, and its own distinct identity and traditions. Unlike all other military formations within the Imperium, a Space Marine Chapter is entirely self-sufficient, with its own forges, warships, support facilities, and support personnel. Space Marine Chapters truly answer to no authority outside their own ranks, although cooperation with the Inquisition, Departmento Munitorm, and the Navigator Houses isn't uncommon. The superhuman abilities of the Space Marines allow them to fight with a tenacity that lies far beyond the capabilities of lesser men, laying down a lethally accurate hail of bolter fire until the foe lies broken and beaten. The Battle Brothers of the Adpetus Astartes cannot rest behind walls or fortifications -- this they leave to the Imperial Guard. Seek, strike, secure -- this is the combat doctrine of the Space Marines. They conduct the most dangerous and crucial of assaults, leading lightning raids behind enemy lines, seizing vital positions, and slaying enemy warlords to render opposing troops leaderless. This build represents the "rank and file" of most Space Marine Chapters. Under the standard Codex Astartes organization scheme, these would be the guys in the Second through Ninth Companies. There are nominally ten Space Marines per Squad and ten Squads per Company. Each Squad is led by an experienced Marine given the rank of Sergeant, with truly experienced leaders promoted to Veteran Sergeant. The stats above should be good enough to represent "regular" Sergeants, although you might want to give him a unique weapon. I plan to have other builds in the future for Veteran Space Marines (Vet Sergeants, as well as Sternguard and Vanguard Vets), Terminators, Scouts, and the various specialists and commanders, like Apothecaries and Librarians. I may eventually get to the rest of the 40K menagerie, with Orks, Eldar, and the rest. No promises as to a time frame though! I've been a fan of the popular war-game Warhammer 40,000 ever since I was introduced to it with its first edition in the Summer of 1990. The game has gone through a number of updated editions over the decades and been spun-off into role-playing games, video games, novels, radio plays, t-shirts, and just about everything short of a feature film** or tv show. If you've been involved in any of the traditional geek hobbies like RPGs or video games for more than a few months, I can almost guarantee you've come across "40K" in some form or another. The "poster boys" for the whole deal is without any doubt the iconic Imperial Space Marines. Despite the fact that several great official RPGs set in the 40K universe exist, I have always had fun adapting them into the M&M system. Needless to say, the grim darkness of the 41st Millennium is a stark difference in tone from all but the dourest of Iron Age comic book settings, but I've always imagined it could be fun to have a superheroic Earth invaded by a warpstorm tossed Chapter of Space Marines. A single Battle Brother has the raw power to go toe-to-toe with most superheroes and a full ten-man Squad of them would probably give most Avengers or Justice Society line-ups a solid challenge. A full-scale planetary assault by a full Battle Company, with the Tanks, Dreadnoughts, Aircraft, and attached assets drawn from the supporting Companies would probably be as big a threat as anything else the Justice League of America has ever dealt with. * Treat as a combination of Expertise: History and Expertise: Tactics, but limited only to those taught by the Space Marine's own Chapter. ** Although if you can track down a copy of the German fan film Damnatus I highly recommend it! Last edited by Batgirl III on Fri Jun 01, 2018 6:38 pm, edited 1 time in total. I loved these guy's.When i was in HS,i was given a couple of boxes and the First Codex as a birthday gift,and i fell in Love with it all. Depending on the Mission, taking out the enemy’s HQ Unit(s) might be all you need to do to secure victory. We'd flip a quarter and whoever won the toss-up got to pick Objective.And it was always Retrieval they'd pick.My record isn't horrible by any standards (I was a Top Dog in my Area for Skirmishes),it's just that I'd get bad match-up's for Tournament's . Tactica Imperium wrote: A good soldier obeys without question. A good officer commands without doubt. Space Marine Veteran Sergeants have survived at least a century and often longer as leaders of their squads, earning invaluable tactical and strategic skill but also honing their already formidable combat abilities. Mechanically, Veteran Sergeants aren't that much different than the Battle-Brothers they lead, but they are better educated, better equipped, and have access to some truly nasty wargear. Most Space Marine Squads are made up of ten Space Marines, as outlined above, but some will be led instead by a Veteran Sergeant. The exact number of Veteran Sergeants available to a Battle Company will vary depending on battlefield attrition, current deployments, and the like. It is probably best to assume that no more than a third of any Company's Sergeans can be considered Veteran Sergeants. The main exception to this rule is the elite First Company, which consists only of Veteran Marines organized into Sternguard, Vanguard, and Terminator Squads (to be detailed later). The tendency for Space Marine leaders to run around without helmets actually stems from both artistic trends (artwork with a visibly human face draws in the viewer more and allows the artist to convey emotions) and from table-top practicality: it's easier to pick-out the bare-headed toy soldier from a few feet away when he'd otherwise be lost amongst two dozen uniformly armored fellows. The idea is that he still has his helmet with him, he's just doffed it for a moment to get better peripheral vision, show contempt for the enemy, or something. In the days of lead and pewter minis, the sculptors of bare-headed figs often had the helmet attached to the character's belt. This is actually pretty easy to do yourself with the modern plastic guys, just snip off the neck and glue it to the belt... But, it does add an awkward bit of bulk to the mini, so I get why a lot of people skip it. M&M3e's system isn't quite fiddly enough with details for me to have specifically called out the differences between helmeted and helmetless marines. But, if your curious, none of Auto-Senses nor do the Osmotic Gill, Nutrient Recycling, and Bio-Monitor work without the helm. Of course, with the helmet on, a Marine cannot use his acid-spitting Betcher's Gland* nor take advantage of his Neuroglottis' enhanced sense of taste. I leave it to the discretion of individual Game Masters for how they want to handle removing and donning a helmet, but I'd probably call it a free action. * Actually, as Spectrum pointed out on the old boards: "[Y]ou still can- but would you really want to?" Eww. Sgt. D'Kestrel; Raven Guard 1st Company wrote: We go where we wilt. We slay who we wilt. Let the Emperor judge the righteousness of our deeds. 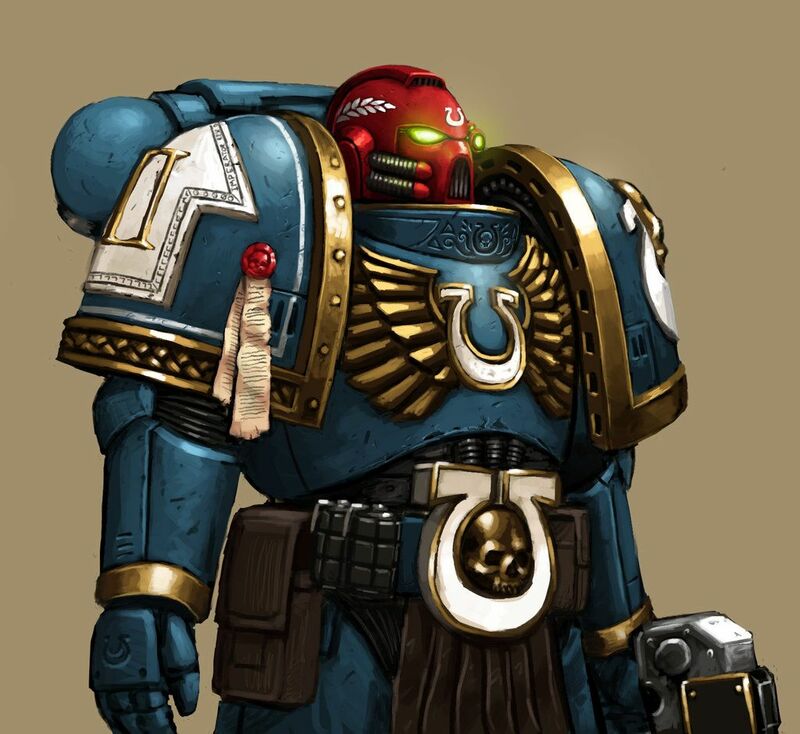 Space Marines of the First Company have won renown on battlefields uncounted and have earned the respect of their Battle-Brothers through deeds of incredible valor. Every member of the First Company is proficient in all manner of weaponry and stands as a living exemplar of the ideals and purpose of the Chapter. 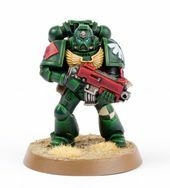 With such status comes the right to select weapons of choice from the Chapter's armory and, as a result, Veterans Squads are much less rigid in composition and doctrine than other Space Marine formations. A Vanguard Veteran Squad is formed from those members of the First Company that excel in close quarters combat. Most have completed centuries of service in the Chapter's Assault Squads, often as Sergeants, their skills honed in bloody battle on a thousand worlds. Vanguard Veteran Squads and their "lesser" counterparts of the Assault Squads are a bit of an odd duck in the tabletop war-game, due to quirks of the math that underpins the whole game, they just aren't nearly as great in melee combat as the game designers seem to think they are. It's a common truism of the war-game that no Space Marine is as good as the fluff makes them out to be, this is mostly for the simple reason of playability (and the fact that 95% of the "fluff" is written as in-universe propaganda). The thing is, Vanguard Vets and Assault Squads just aren't very effective on the table compared to the other options available in most Space Marine codices. Blood Angels being the notable exception. However, since M&M is driven by the narrative needs of the story and not the needs of a war-game where units are limited by points available, game play goals, and one's personal budget for toy soldiers, I can breathe some life back into them. In an M&M context, Vanguard Veteran Marines are a scary combination of speed, maneuverability, and damage. They can tear-up almost anything in close quarters, but have a pretty limited ability to deal with things outside of Bolt Pistol range. I confess that in decades since I became a WH40k player, I have never actually fielded an Assault Marine Squad or a Vanguard Veterans Squad. In fact, out of my entirely too large collection of Warhammer 40k figs, I've only got one single marine in a jump pack! Sergeant Quietus Adonis of the Blood Angels, whom I put together for a friend in our first Deathwatch RPG campaign using some bitz bought specifically to do so. I love the idea of jump-pack marines, I just never have any place for them in my armies. Since I can't use them in my tabletop army, Sgt. Adonis and the rest of his Deathwatch Kill Team currently stand vigil on my bookshelf, guarding against any xenos trying to steal my Godzilla DVD's. Last edited by Batgirl III on Fri Jun 01, 2018 6:39 pm, edited 1 time in total. I was wondering how game-literal these translations were. My WH40k knowledge is pretty limited, but I don't think space marines are that much stronger than imperial guardsmen on a one-to-one basis? theyre much stronger actually, fluff wise theyre superhuman game wise Space Marines have a strength of 4 while guard have a 2 or 3. theres a reason the primarchs became virtual gods on the worlds they were dropped on. That's a 4 out of 10, though, right? 1 point of difference on a 10-point scale? And the same for accuracy? I dervied most of my numbers from the Deathwatch RPG and the more detailed "fluff" books like the old Index Astartes series (originally in White Dwarf magazine but then printed in book form). Of course, the Ranks & Measures Table for M&M doesn't give an exact one-for-one transition. My Marines are probably a wee bit too weak, honestly. Per the the Deathwatch RPG, a Space Marine will have a Strength Attribute of 2d10+30. Thats an average of 41 (This give a Strength Bonus of 4, used for some subsequent calculations) and the Unnatural Strength (x2) Trait (this makes you treat your Strength Bonus as double). Likewise, a Toughness Attribute of 2d10+30 (Avg. 41) and the Unnatural Toughness (x2). A Space Marine's Power Armor increase their Strength by +20, but the effect on Strength Bonus is calculated after the Unnatural Strength multiplier. In short, your average Marine is Strength 61, Strength Bonus 10; Toughness 41, Toughness Bonus 8. In the the Deathwatch RPG a character's Carrying, Lifting & Pushing Weights are calculated by the sum of their Strength Bonus and Toughness Bonus, which is going to be an 18 for the average marine. This gives a carrying weight of 1,350 kg (2,976 lbs. ), lifting weight of 2,700 kg (5,952 lbs. ), and a pushing weight of 5,400 kg (11,904 lbs.). It is possible with a dice roll to exceed these "max" limits if you need to. My M&M Marines have an effective Lifting Strength of 5 in their Power Armor, for 725 kg (1,600 lbs. ), they should probably be closer to M&M Lifting Strength 6... But, hey, that's what Athletics Skill Checks are for, right? Those are the numbers from the war-game, which should be seen as "artificially" flatting the differences between the factions for better game play. I'm shooting for a slight more "narrative" approach to the stats. I get you. Statting out the story world, more than the game the story world is initially based on.